(CBS) - More than two trillion text messages are sent every year in the United States alone. And most of those texts are not the free kind. Some carriers charge as much as 20 cents to send and another 20 cents to receive. In fact, they have generated $20 billion in revenue for mobile businesses like Verizon and AT&T. Soon, companies making all of those dollars may see a drop in revenue as Apple launches iMessage, a service that will allow iPhone owners send messages with text, photos and videos. iMessage will send messages over a Wi-Fi or cellular data connection and is part of an update to Apple's iOS, reports New York Times. Service providers, like Verizon, which gets $7 billion a year from texting fees, should be worried. "It could have a damaging impact on mobile carriers," reports TG Daily. iPad and iPod Touch users can also use the service if they upgrade their devices to the latest operating system. 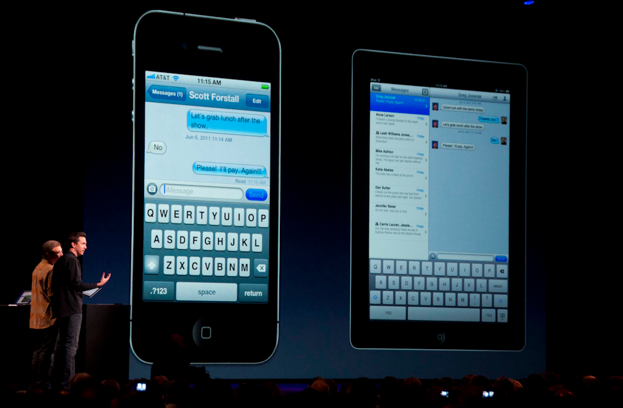 Once updated, users will be able to send an unlimited number of messages from their iOS 5 devices to other iOS 5 devices for free, says International Business Times. This is not the first of its kind. Other services like BlackBerry's BBM also provide mobile phone users a way to send messages via data plans - and the feature has kept users from switching to an Apple or Android, says International Business Times. "Services like iMessage transmit messages over the carriers' data networks and the Internet, much like e-mail," according to New York Times. "Cell phone customers pay for each text message or sign up for a texting plan, while the newer messages will fall under a customer's wireless data plan."